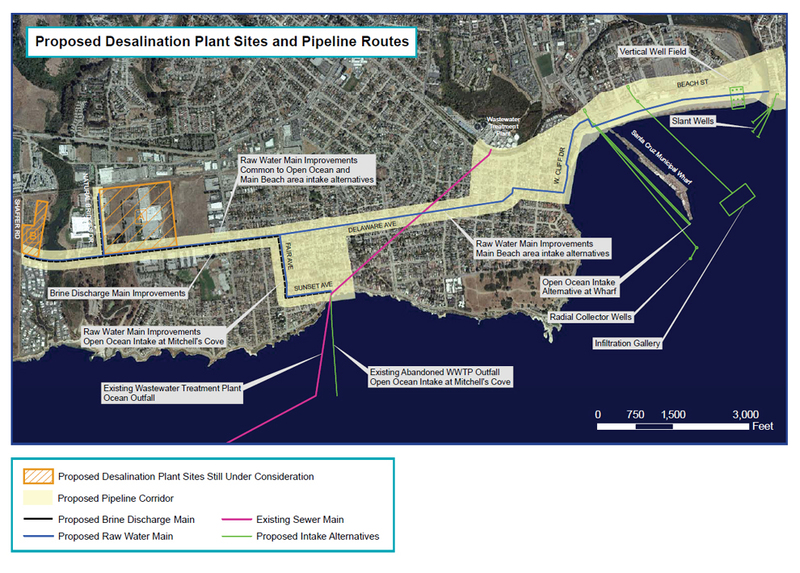 A couple days ago my friend asked me to join her at a meeting about a ballot measure related to the construction of a desalination (desal) plant in Santa Cruz, California. The idea of the public gearing up to oppose desal in the city encouraged me to do background research on the issue, and it also reminded me I am now living in the sometimes-arid West. Desal is thought by some to be a solution to water shortages. Development of technologies to extract drinking water from saltwater in a sustainable way would be a huge advance, but most current technologies are expensive in terms of infrastructure and energy. 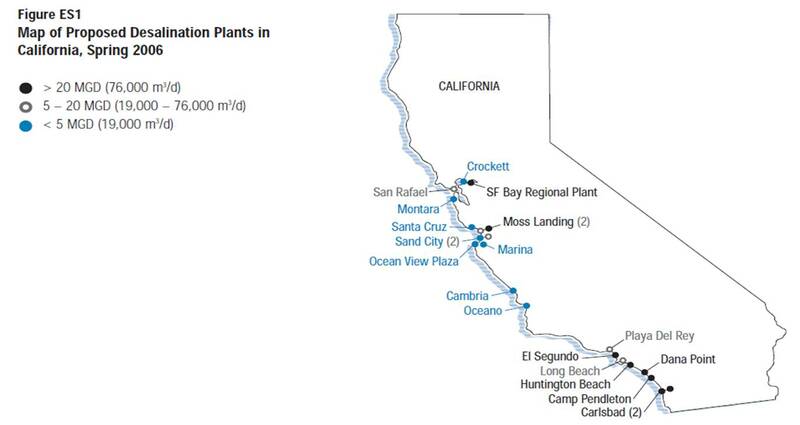 Still around 20 desal plants have been proposed for California, according to a 2006 Pacific Institute report. Proponents cite benefits like water for development and during drought, but the report states other water alternatives should be used first. Such water alternatives include treating low-quality water, regional water transfers, improving conservation, recycling wastewater, and smart land-use planning. Santa Cruz is the yet another place in California with public outcry related to a proposed desal plant in their our backyard. The city proposed desal to supplement water during drought years and for development, and they are planning to spend 15.5 million dollars researching this proposed plant. Local citizens like Rick Longinotti found out. They were worried about associated negative effects including excessive energy use, expensive water, and impacts on marine life. He formed a group called Desal Alternatives with others. This organization identified several alternatives to supplement existing water sources such as treatment of wastewater, a local water transfer, and water conservation measures. Local citizens also knew they needed a measure on the ballot to allow citizens to decide whether they should have a right to vote on a proposed desal plant. People came together to form a non-partisan coalition called Right to Vote on Desal. This group draws membership from local organizations including Desal Alternatives, Transitions Santa Cruz, Peak Water, a group opposing UCSC expansion, and others. They collected the 5,000 signatures necessary to get Measure P added to the November ballot. If approved, Measure P will ensure that citizens have a right to vote on the proposed desal plant (likely in 2014). Multi-stakeholder engagement in desal is likely to become widespread in California in the years to come, as detailed in this article. The Pacific Institute states only one of 17 projects proposed in 2006 have been built with one other securing all needed permits. Santa Cruz citizens discovered Marin County voters were fighting desal using a ballot measure, and they followed in the same accord. I believe it’s probably just a matter of time before other communities also take a stand – to have the right to decide whether or not it’s something they want in their backyards.